On Save Troy Library Tuesdays we have a simple goal: share good things about Troy Public Library. 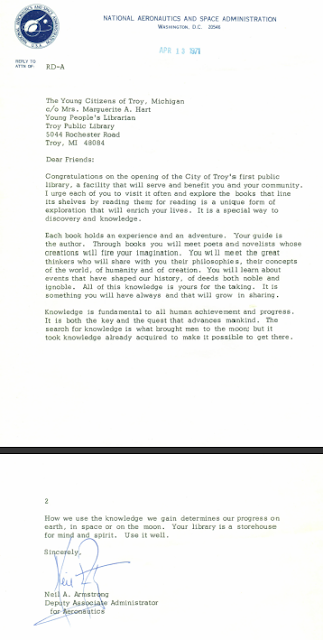 This week in addition to updates and Letters to the Children of Troy, we offer a sweet little interview with Troy Public Library Director, Cathy Russ. So, take a break and read on! In May the Four of Us visited TPL and met Cathy; she has a way with people and had the girls from the first moment, talking books, and connecting over the loveliness of TPL. 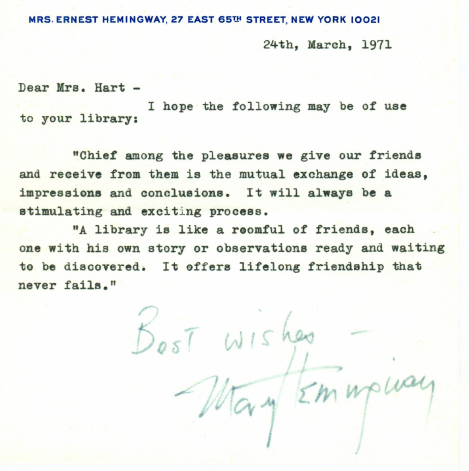 And thus started a friendship deeply rooted in two things: library love and book love. Together we came up with interview questions for Cathy and she happily obliged! How long have you worked at Troy Public Library? I worked at the Troy Library from 1991-1993 as a part-time Circulation clerk; then as a full-time Circulation clerk from 1993-1995. I left TPL in 1995, worked at a bunch of different libraries, and then came back as Library Director in June 2007, so just over 4 years ago. So my total time at TPL as an employee is 8 years or so. Tell us about your life as a librarian, when did you know you wanted to be one? Do you like your job? LOL!! I am laughing b/c I never really wanted to be a librarian. It NEVER occurred to me, even though I loved libraries and reading so much. I worked in libraries from 1991-2000 in the Circulation department (the people who check out your books, take your $$ for fines, give you a library card, etc). 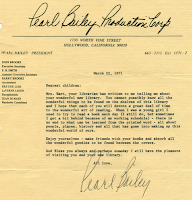 Then, in 2000, I was offered the chance to be the director of a small library, the Center Line Library. I started working there in March 2000, and I fell in love immediately! I liked being able to do a little bit of everything. I ordered materials (my favorite part), planned programs, answered reference questions, checked out books, did the budget, etc, and then I knew that this was what I wanted to do. I realized that if I ever wanted to be the director of a large library, like Troy, that I would have to get my master’s degree in library science—be a LIBRARIAN! So I went back to school and got my degree. I do like my job very much. I always have. I don’t like the politics or the controversy, but I like being able to make the library better and better all the time. Bonus question: Do you have a cat or dog or another animal? I have a beagle named Desi, short for Desdemona! She is 3 and she is my baby. I love her very much. She makes me laugh. What is your favorite part of TPL? My favorite part of TPL…hmm. I have always loved the books, but I also love the people who use the library. Many of them are people I went to school with, parents of people I went to school with, or people that I have known for a long time. Troy Library is like a second home to me in many ways b/c I grew up using this library, and have been coming here for 32 years. More on that below. Bonus question: What is your favorite Shakespeare Play? My favorite tragedy is Macbeth (I directed it in 8th grade!) and my favorite comedy is a Comedy of Errors. 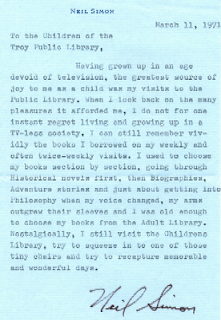 When we visited back in May you shared that you had really grown up at TPL, can you tell us more about that story? Sure! I grew up in Troy. My family had moved around a lot when I was a kid, and when I was 10, we moved to Troy. At that point, my mom told my dad, “no more moving!” (I had 3 different 5th grades, for example). I was blown away the first time I went to TPL, because I thought it was the best library I’d ever seen (I still think that). I was shy and had trouble making friends b/c of all the moving, so the library was my happy place. I loved all the possibilities sitting on those shelves, waiting for me to read them! I came to the library once a week, every week, from 5th grade til I went to college (I even got sick here in the hall once, and I remember it every time I walk down the hall!) I always used the library when I was home from college on break, and then after college, I came back to Troy and got my job here. After I went to another library to work, I joined the board of the Friends of the Library, and also have led book discussion groups here for about 18 years now. After I got my library degree, I substituted here. And then I got my job as Director! 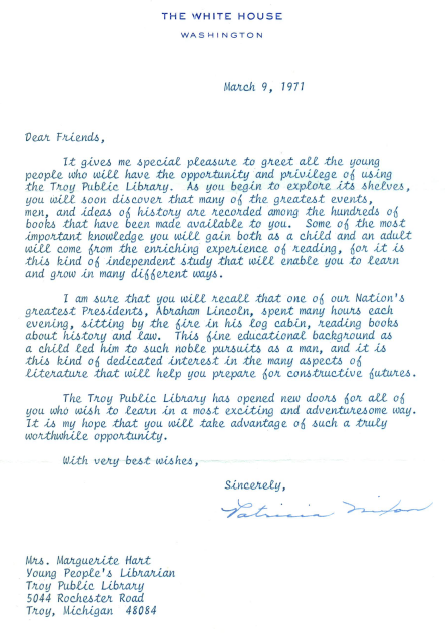 So TPL has been a HUGE part of my life for 32 years. And yes, many of the experiences I have had here lately have surely helped me to grow up, or grow, anyway! If you had a magic wand and could do absolutely anything for the libraries of the world what would it be? Well, I suppose I should say that I would make sure that they had enough money to run their operations on forever! But if I could really really really really do anything, I would wave the wand and have people understand how wonderful libraries are…because then we wouldn’t have to worry about the money, it would take care of itself. Bonus question: Do you have a favorite book? Or a favorite genre? Golly! This is the hardest question of all! I have so many favorite books. The Blind Assassin by Margaret Atwood; Harry Potter; Pride and Prejudice; Case Histories by Kate Atkinson; lots of Agatha Christies; and I could go on and on. I read a lot, across all genres. I love fiction, mysteries, memoirs, biographies, essays, suspense, even a little sci-fi. BUT, when left to my own devices and, my FAVORITE books are British mysteries. I love the Agatha Christie-style, “8 people in a country house, snowed in for the weekend, someone is shot and the door is locked from the inside” type of story. Also the British police procedurals. LOVE THEM. They are like candy for me. I love Agatha C, PD James, Elizabeth George, Deborah Crombie, Kate Ellis. I am weird because I only read the British ones. I don’t read the American authors, i.e. Patterson, Evanovich, Nevada Barr, Robert B. Parker. JUST the British. Thank you Cathy Russ! We can't wait for our next visit. 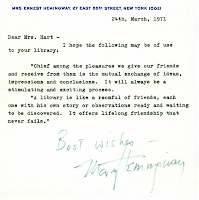 "The library is an indispensible contribution to the quality of life for residents." Pam Brady, President League of Women Voters. The Oakland Press Vote "yes" for Troy Library mill proposal. Book Burning Party Revealed as a Hoax Ian Anstice, who operates publiclibrariesnews.com in the United Kingdom, suggested in his response on the group's page that the committee work to provide information, not promote the use of deception. "I have had people calling me from the USA saying their children were in tears that such evil people cold exist in the USA who could burn books," Anstice wrote. "I will repeat that. Your actions made children cry." Read the letter from the Book Burning Party folks explaining their intentions and Phillip Kwik, Director of Public Services, personal response, click here the letters are in the comments. Are you a Troy resident? Mark your calendar for August 2nd and please vote YES! For more click here. Need and absentee ballot? Click here. 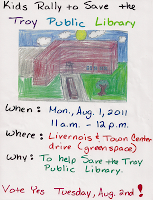 Join "Kids Rally to Save Troy Public Library", August 1st, 11am-12pm. And join us next week for more details and The Sister's interview with the wonderful Yachinsky Kids! And now what is becoming a highlight of The Mom's week: the Letters to the Children of Troy. At the beginning of the summer we divided the letters hoping to share a little bit of their collective wisdom with you each week --enjoy this installment! "Chief among the pleasures we give our friends and receive from them is the mutual exchange of ideas, impressions and conclusions. It will always be a stimulating and exciting process. "A library is like a roomful of friends, each one with his own story or observations ready and waiting to be discovered. It offers lifelong friendship that never fails." Congratulations on the opening of the City of Troy's first public library, a facility that will serve and benefit your community. I urge each of you to visit it often and explore the books that line its shelves by reading them; for reading is a unique form of exploration that will enrich your lives. It is a special way to discovery and knowledge. Each book holds an experience and an adventure. Your guide is the author. Through books you will meet poets and novelists whose creations will fire your imagination. You will meet the great thinkers who will share with you their philosophies, their concepts of the world, of humanity and of creation. You will learn about events that have shaped our history, of deeds both noble and ignoble. All of this knowledge is yours for the taking. It is something you will have always and that will grow in sharing. Knowledge is fundamental to all human achievements and progress. It is both the key and the quest that advances mankind. The search for knowledge is what brought men to the moon; but it took knowledge already acquired to make it possible to get there. How we use the knowledge we gain determines our progress on earth, in space or on the moon. Your library is a storehouse for mind and spirit. Use it well. Having grown up in an age devoid of television, the greatest source of joy to me as a child was my visits to the Public Library. When I look back on the many pleasures it afforded me, I do not for one instant regret living and growing up in a TV-less society. I can still remember vividly the books I borrowed on my weekly and often twice-weekly visits. I used to choose my books section by section, going through Historical novels first, then Biographies, Adventure stories and just about getting into Philosophy when my voice changed, my arms outgrew their sleeves and I was old enough to choose my books from the Adult Library. Nostalgically, I still visit the Children's Library, try to squeeze in to one of those tiny chairs and try to recapture memorable and wonderful days. 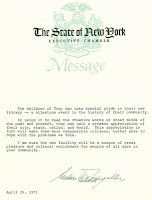 The children of Troy can take special pride in their new library -- a milestone event in the history of their community. By using it to read the creative works of great minds of the past and present, they can gain a greater appreciation of their city, state, nation, and world. This appreciation in turn will make them more responsible citizens, better able to cope with the problems we face. I am sure the new facility will be a source of great pleasure and cultural enrichment for people of all ages in your community. 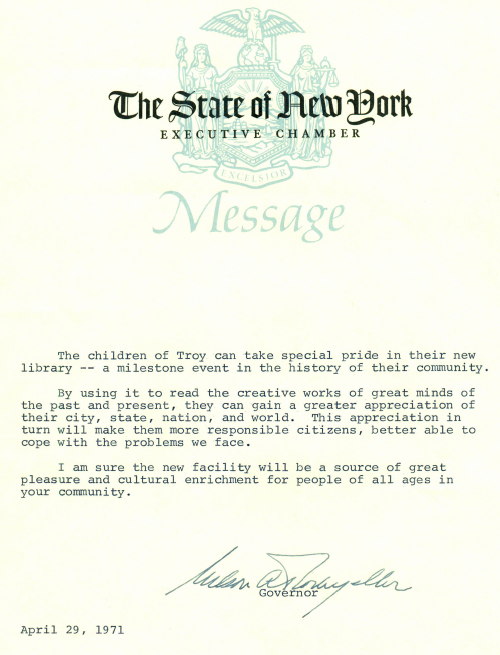 It gives me special pleasure to greet all the young people who will have the opportunity and privilege of using the Troy Public Library. As you begin to explore its shelves, you will soon discover that many of the greatest events, men, and ideas of history are recorded among hundreds of books that have been made available to you. Some of the most important knowledge you will gain both as a child and an adult will come from the enriching experience of reading, for it is this kind of independent study that will enable you to learn and grow in many difference ways. Nation's greatest Presidents, Abraham Lincoln, spent many hours each evening, sitting by the fire in his log cabin, reading books about history and law. This fine educational background as a child led him to such noble pursuits as a man, and it is this kind of dedicated interest in the many aspects of literature that will help you prepare for constructive futures. The Troy Public Library has opened new doors for all of you who wish to learn in a most exciting and adventuresome way. It is my hope that you will take advantage of such a truly worthwhile opportunity. 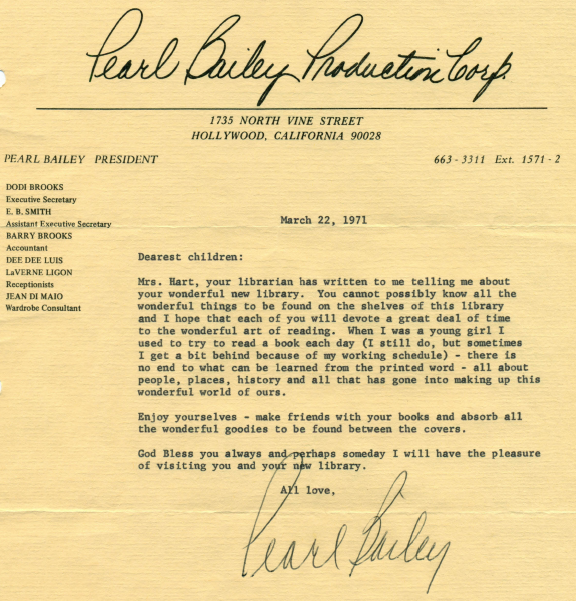 Mrs. Hart, your librarian has written to me telling me about your wonderful new library. You cannot possibly know all the wonderful things to be found on the shelves of this library and I hope that each of you will devote a great deal of time to the wonderful art of reading. When I was a young girl I used to try to read a book each day (I still do, but sometimes I get a bit behind because of my working schedule) -there is no end to what can be learned from the printed word - all about people, places, history and all that has gone into making up this wonderful world of ours. Enjoy yourselves - make friends with your books and absorb all the wonderful goodies to be found within the covers. God Bless you always and perhaps someday I will have the pleasure of visiting you and your new library. Simple: just tell two friends and ask them to tell their friends to pass this message to the people of Troy "VOTE YES August 2nd and Save Troy Public Library!" What a great interview! The Sisters asked some very good questions and I loved all of Cathy's answers, especially the one about her wish for all libraries. Cathy is one of my oldest and dearest friends. We both grew up in Troy and TPL. It is heartbreaking that we are in danger of losing our precious library. 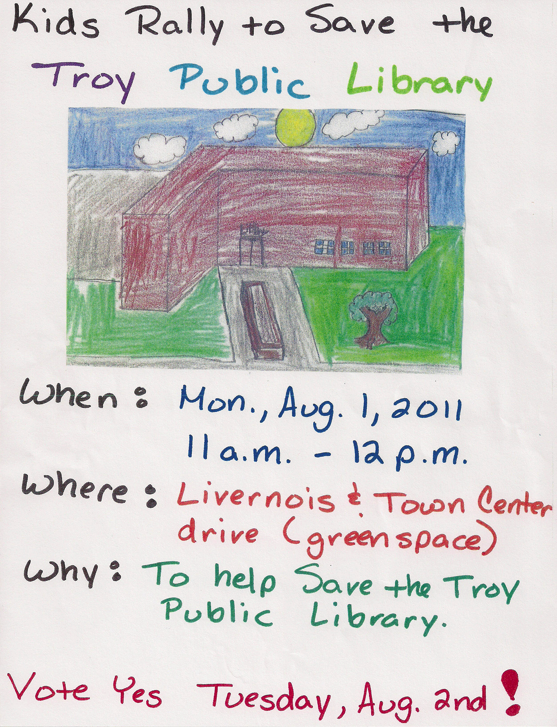 Thankfully, there are many good people in Troy who are working very hard to save TPL. Thank you to The Books for Walls Project for your support!